We just checked out Barry Levinson‘s (Rain Man, Diner, Wag the Dog etc.) 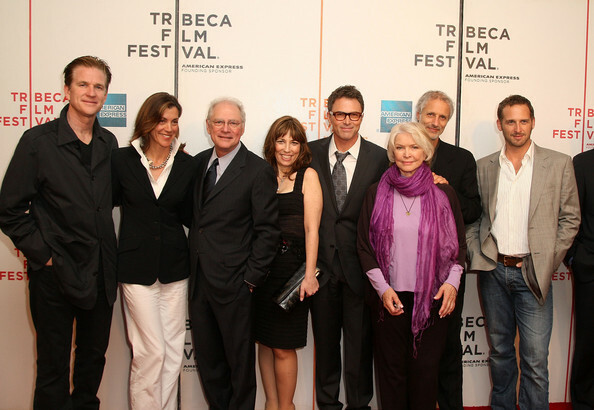 new documentary Poliwood at its Tribeca Film Festival premiere. It’s about a bunch of actors, including Spike Lee, Ron Silver, Ellen Burstyn, Susan Sarandon, and Anne Hathaway, who go to the ’08 GOP and Dem Conventions (where Boogie Man was playing, btw) with Hollywood’s Creative Coalition. Every year I produce network TV awareness campaigns with celebrities, so it raised a lot of interesting questions. Why do some actors get so attacked for addressing issues? Which celebs really know their stuff and which don’t? Are certain ones ‘using’ issues for image rehab or to boost their Q-rating? I wonder if some of the backlash isn’t because Americans resent being ‘lectured to’ by glamorous, insanely rich, good-looking, occasionally incredibly talented people. It doesn’t matter if, as several actors in the film protest, they often come from working class backgrounds. We want our celebs to glimmer, to be otherworldly, above us. They provide Americans a quotidian connection with the divine, like roadside shrines to the Gods in ancient Greece. LeBron James – Hercules. Angelina Jolie – Hecate. Roger Clemens – Icarus? It’s even better when the gods are flawed; petty, shallow, squabbling – like us, only more so. Anyhow, one scene in the film blew my mind. Legendary Republican consultant Frank Luntz attempts to begin a presentation to the group. He’s the guy who started out with Newt and ate the Democrats’ lunch for the better part of the last decade, expertly influencing public opinion with expert wordsmithing, eg. changing “estate tax” to “death tax” to provoke visceral outrage. He’s become something of a bete noire to the left. Whatever you may think of the guy, doesn’t it make sense to at least listen? Luntz launches into ball-busting Alec Baldwin Glengarry Glen Ross mode. He says their cause – increased arts funding – is noble, but they have no clue how to use language. Here it is, Boogie Man viewers, the central Lee Atwater insight: Democrats connect with the intellect, and Republicans wallop them by reaching voters’ emotions. Fascinated, the actors listen intently as this PhD. from Oxford shares the insightful wordsmithing techniques he used to help the GOP reshape America, right? A couple of actors get pissed at Luntz’s ball-busting, angrily attack him, and derail the session. The film cuts to actress Susan Sarandon, protesting afterwards that she wanted to hear what Luntz had to say. Of course she did. She’s incredibly smart and could have put his techniques to good use. At the Tribeca Q&A, one actor said somewhat sheepishly he thought Luntz had suckered him into his emotional response. (Ironically proving Luntz’s point: we’re all controlled by our emotions). Luntz denied it, saying as a lifelong TV watcher he was totally traumatized by such a brouhaha with TV stars. A sad moment for American arts funding and cross-party dialogue. Damn. What could Luntz and these activists have accomplished?